Another former Leeds United manager came back to haunt the club as Neil Warnock’s QPR inflicted more pain on the Whites. United fans laid into the team and management at the end after seeing their side once again lose 1-0 to slip further into what increasingly looks like being another relegation scrap in the Sky Bet Championship..
Charlie Austin’s header on 58 minutes proved the difference between the sides, but hosts Rangers, who started the day only just above Leeds in the table, were the better team for much of the contest to put Leeds boss Steve Evans under pressure. 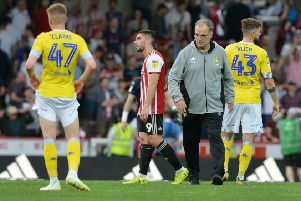 With a tough game to come now against promotion chasers Hull City next weekend at home it look like he will now be relying on owner Massimo Cellino getting hitherto unheard of patience if he is to remain in charge by Christmas - unless there is a sudden change of form. Evans made two changes to the side that lost to Rotherham the week before, bringing new loan signing Liam Bridcutt in for his debut in place of Luke Murphy and Charlie Taylor returning from illness at left-back with Gaetano Berardi suspended. Bridcutt’s main contribution was to get booked in the eighth minute after hauling down Junior Hoilett, but he was unable to bring about much improvement in Leeds’ play as they played the ball long for the most part. Goalmouth action was initially scarce as both sides showed why they are in the bottom half of the table. Stuart Dallas fired a volley well over for Leeds before Chris Wood had the side’s first real chance, rounding home keeper Robert Green after getting on the end of a poor back pass, but the angle proved too tight and he could only shoot over. QPR’s best chance saw Grant Hall head over from a corner while Michael Petrasso fired over after seeing a shot blocked. But it was no surprise it remained goalless to half-time. The second half saw Stuart Dallas shoot over before the hosts opened the scoring through Charlie Austin’s first touch after coming on as substitute. The dangerous striker, who has a good record against Leeds, was left unmarked from a corner to head home for what turned out to be the winning goal. Leeds rarely looked like hitting back and it was Rangers who came close to scoring more goals in the remainder. Austin’s powerful header almost brought him a second while Marco Silvestri was forced to make s superb save to deny Austin after he got yet another header in. Alejandro Faurlin curled a shot wide from distance, Matt Phillips went close and Silvestri had to make another good save to keep out Tjaronn Chery’s effort, but it was all to no avail as the Whites suffered a second straight defeat and their third in seven games under Evans, who said the performance had been massively disappointing. Evans said: “It was a poor performance. “We started the second half properly and the goal came against the run of play. “You can’t let Charlie Austin run away and take a free header like he did. QPR: Green, Onuoha, Hall, Perch, Konchesky, Phillips, Faurlin, Yun (Chery 56), Sandro, Petrasso (Austin 56), Hoilett. Leeds: Silvestri, Wootton, Bellusci, Cooper, Taylor, Dallas, Bridcutt, Cook, Mowatt (Botaka 67), Antenucci (Erwin 80), Wood.